Mat Mania – The Prowrestling Network, known in Japan as Exciting Hour - The Prowrestling Network (エキサイティング アワー ザ プロレスリング ネットワーク), or simply either as Mat Mania or Exciting Hour (エキサイティング アワー), is a 1985 Japanese pro wrestling-themed arcade game developed by Technōs Japan and published by Taito. It is a spiritual successor to the 1983 arcade game Tag-Team Wrestling, also developed by Technōs Japan, but published by Data East. It was also ported to the PS4 console in 2015. The game is played by one or two players (alternating in turns). It is recognized among game enthusiasts as the first of the genre to have achieved a high level of playability. Further, the game aesthetics, sprite concepts & design, in-game theme music, and comical presentation have lent well in preserving it as a beloved arcade classic. Screenshot of the arcade version, featuring The Player vs Insane Warrior. The game is presented in the guise of a televised pro-wrestling broadcast, the Taito Wrestling Association (Technos Wrestling Association in the Japanese version). The intro sequence and subsequent intermissions portray a disheveled pro-wrestling host, Cory (Nari in the Japanese version). His hair is unkempt and his sleeves rolled up as he manically announces the particulars of the upcoming bout. The player controls a wrestler who makes his way through the ranks of the TWA, challenging various thematically colorful opponents, before finally challenging the champion in the fifth match. Upon ascending to the championship, the player is presented with a championship belt in a presentation ceremony. The player must then defend his title against the previous five opponents, drawn at random. The player-controlled wrestler was possibly modeled after The Dynamite Kid. Called simply "YOU" in Exciting Hour and Mat Mania, he is dubbed Dynamite Tommy (the Dynamite Kid's real name is Tom Billington) in Mania Challenge. However, there are signs held up in the crowd which read FIGHT TOMMY and TOMMY GREAT, and since all the challengers have a name, the name Tommy only could refer to the unnamed player's character. He sports shaggy brown hair and wears blue trunks and white boots. His assortment of manoeuvres include: a Punch and a high Kick, and a shoulder block from a standing position; from a Headlock, an Irish Whip, a Body Slam, a Piledriver, and a Vertical Suplex; upon a running opponent, a Back body drop, an Elbow Smash, a Clothesline or a Jumping Back Kick; upon a downed opponent, a running Body Splash, or, from a turnbuckle, a Sunset Flip or a Knee Drop. The player-controlled Wrestler is fashioned after common "Babyface" performers of the era. Named as Insane Worrier in Exciting Hour. Fashioned after fanciful, dystopian Punk/Barbarian themed performers popular during the 80s (most notably Road Warrior Animal). Characteristically, presented with a Mohawk hairstyle, loose-fitting black trousers and heavy make-up. Accordingly, his maneuvers are limited to unskilled clubbing blows and a Gorilla Press Body Slam as his ultimate move. Also, unique from other opponents in that he pins the player-controlled wrestler using only one hand. He has the Player's Elbow Smash and Clothesline. A martial arts themed wrestler. His silken, Manchu style trousers and slippers indicates something of a misnomer - Kung Fu Fighter seems more appropriate. Typically his maneuvers include fast, kicking strikes, jump kicks, and karate chops (used as a normal grasp and also as his finishing move). His hair is shaggy and covers his face, suggesting possible inspiration by The Great Kabuki, Chopsocky, or well-known martial artists such as Bruce Lee and Bolo Yeung. In the introductory sequence he is depicted with what would appear to be a set of nunchaku; however, this weapon is not used during actual game-play. He is the only opponent who doesn't possess any of the Player's moves. Karate Fighter's character concept was later adapted by Technos for the Chin Taimei character featured in the NES version of Double Dragon. Named as Coco Savege in Exciting Hour. A "Wild Man" themed wrestler, clearly inspired by Bobo Brazil. Depicted wearing a Leopard skin and barefoot, he is unique from other opponents in that his attacking style is especially swift. He neither punches nor kicks; rather, he is the only opponent to use the shoulder block, the same used by the Player. His unorthodox and unpredictable fighting style includes shoulder blocks, coconuts (punches to the head while in a headlock), a Mongolian Chop and Giant Swing Throw as his finishing move, as well as a Body Splash on a downed opponent. He's quite possibly the most difficult opponent to beat in the game. 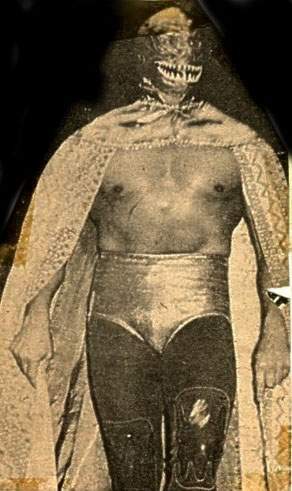 A masked "rúdo" themed wrestler fashioned after Mil Mascaras, who often used a mask with a shark teeth design. Pirania uses illegal tactics, like choking, and cheating to win his matches. He possesses the Player's back body drop. He also uses a Clawhold, performed after whipping the Player off the ropes, which drops the Player to his knees almost immediately. Perhaps his most effective, and most humiliating, move involves suspending the Player above the mat by grabbing his hair with one hand, and illegally gouging him square in the eyes with the other. He also uses an elbow drop as his ultimate move. Named as Blues Bloody in Exciting Hour. The TWA World Champion, who uses his strength and skill to overpower his opponent, clearly inspired by famed All Japan Pro Wrestling star, Bruiser Brody. In some versions of the game, the world champion changed to more closely resemble Hulk Hogan to reflect the rise of Hogan's popularity, although the character's furry boots (a la Brody) remained intact.He was named as Golden Hulk in Mat Mania for the purposes of U.S. licensing, likely to exploit the popular appeal of Hulk Hogan in that market. He uses Hogan's "Legdrop of Doom" as a finisher. He also has the Player's Body Slam (performed one-armed - another homage to Brody) and Elbow Smash, plus a Dropkick, which the player's character later gained in Mania Challenge. A T-shirt depicting an ancient Toltec petroglyph, presumably representing the band Einstürzende Neubauten. Atari released an Atari 7800 version of Mat Mania titled, Mat Mania Challenge This version was faithful in some aspects like graphics and controls. However, it was reviewed poorly by most magazines and game players because it was missing all the villain characters (due to the amount of low memory Atari cartridges were known for). Atari described this version as a cross between Mat Mania and Mania Challenge, as this game features both Dynamite Tommy and Hurricane Joe. A version for the Atari XE Game System was also planned but was never released. A prototype copy of the Atari XEGS version was once available for a limited time sale via longtime Atari seller B&C ComputerVisions. Mania Challenge is an updated version of Mat Mania released in 1986, a year after the original. The main difference between it and the original is the addition of a two-player competitive mode. The first player takes control of the main character from the original game, now named Dynamite Tommy, while the second player controls a new character named Hurricane Joe, who plays identically to Tommy. Mania Challenge also features several countering techniques to the player's moveset from Mat Mania such as countering a headlock with an atomic drop or a suplex, or throwing drop kicks. However, the character roster was reduced to only three opponents in the single player mode: the Insane Warrior, the Golden Hulk and the other player character controlled by the computer (Dynamite Tommy or Hurricane Joe); repeating those three opponents in subsequent loops. This page was last edited on 12 January 2019, at 17:01 (UTC).